Call me old fashioned if you will, but I still believe in the premise that when a customer places an order online, they should receive their goods within the timeframe highlighted by the retailer. Or better still, they should actually receive their order at all! How about really stretching it and offering the customer the opportunity to choose a convenient delivery method and time? We in e-commerce put so much focus and emphasis on improving the customer experience on our sites and increasing conversion rates by delivering new and innovative functionality and features that enable the customer to find what they’re looking for more quickly and easily (searchandising, improving the customer journey and purchase path). We also spend significant sums driving users to our sites, recruiting them and coming up with incentives and great ideas for retaining their custom. But I really do believe that the last mile, the experience the customer has when taking receipt of their order, is the one process we pay the least amount of attention to. Given that it is common knowledge how much more costly it is to recruit a new customer than retain an existing one, it’s a strange phenomenon that we should choose to focus almost exclusively on the former, at least from a customer experience perspective that is. Irrespective of how good the online experience is, if we get the last leg wrong, we generate significant negative word of mouth as well negative word of web (WOW), and we all know the viral impact the latter can generate! According to a recent survey by Service XRG, customers that have a positive customer experience are four times more likely to recommend a company or renew an existing relationship. I shudder to think what the flip side ratio is for those who had a negative experience! I’m sure someone will forward that statistic to me. The fact that the majority of retailers still offer one basic or standard delivery service suggests that this element of the customer experience is largely ignored. A report by Snow Valley in August 2007 intimated delivery had improved over a two year period from 2005 as retailers had invested time and effort into improving the consumer choice and quality of service they wanted. Whilst I agree it has improved, we need to view this in context and in relation to how poor the delivery offer was in 2005. Sure, quite a number of retailers now offer some degree of choice on when you want your goods delivered, but in my book we don’t offer enough choice. And yes, a large % of orders arrive within the timeframes highlighted on the retailer’s website, but those timelines are fairly lengthy to begin with. There are still plenty retailers offering delivery within ‘3 to 5 working days’. So this doesn’t necessarily make it a good customer experience. It’s a similar scenario to the no-frills airlines who report a consistently high % of flights arriving on-time. This is partly achieved by building in an extra half hour into the published flight time! It seems clear that the vast majority of retailers fall well short when it comes to achieving this. This is partly driven by the lack of channel integration, but in this context it’s also accentuated by the volume of poor delivery experiences. The lack of consistency with delivery from the distance selling channels not only fuels negative word of mouth but it erodes brand equity. All of this said, retailers are not the sole perpetrators of this issue – at the end of the day we don’t deliver the goods ourselves (with the very odd exception), and are therefore at the mercy of the couriers. The couriers would argue that this is a market growing extremely quickly, and many have had to adapt their own models to meet this growing demand. But the bottom line is that the customer’s contract is with us, the retailer, and therefore it is incumbent upon us to ensure we provide the levels of service and service levels the consumer demands. I speak as both a user who has been at the wrong end of this poor customer experience on many occasions as well as a retailer who is still trying to provide the optimum experience and who has had to appease countless numbers of customers over the years who have been rightly disappointed as a result of having their order turn up late, not turn up at all or turn up damaged. At Ted Baker, we currently offer two services; a standard 2-3 day delivery or the option to specify the date you want your goods delivered (including a Saturday). However, we will be implementing a next day service in the very near future and are reviewing a number of other options. Like many other retailers, we too still have challenges when it comes to providing a consistent delivery service. Please find to follow some tips and considerations that emanate from the many mistakes I’ve made, and lessons I’ve learned from this crucial part of the customer experience. I’d recommend against offering customers the choice of specifying where to leave their goods in the event they aren’t in. This can often result in lost goods. Do have a POD (proof of delivery) service – it takes any ambiguity out of the equation. Decide on who is going to manage the communication with your customers in relation to delivery of their order. If it’s the courier, make sure they have processes, procedures and the people in place to handle effective customer communication, otherwise manage this process in-house. Don’t only look at the overall service levels offered by the courier, look into the potential impact of individual issues as these can often be serious enough to outweigh an overall service level that at the outset appears to be a good KPI. What size is your business and will that affect how your business is viewed by the courier and the priority given to your customer’s orders? Is the courier already delivering similar goods? Is the courier already providing similar delivery options or are they introducing a new service to meet your needs? And if they are, do you really want your brand to be the Guinea Pigs for this new service? Is your product at a higher risk of fraud? If it is, this may influence your choice of partner and also the delivery choices you offer. Don’t only look at costs. A cheaper courier service does not necessarily equate to higher margins and more profit. Failure to deliver the right level of service more than erodes any saving made on fulfilment costs. Could you use RFID or some other technology to provide the customer with the ability to track their order at a more granular level than they can at present? Offer as many delivery options to the customer as possible, the more choice you provide, the easier you’ll make it for them to buy, and therefore you’ll increase your conversion rates, but whatever options you do choose to offer, make sure you deliver on your promises! One of my favourite quotes is from Charles Dunstone, founder and CEO of the Carphone Warehouse in which he says “always under-promise and over-deliver”. Excuse the pun but I do think this lends itself rather well to the issues with delivery. 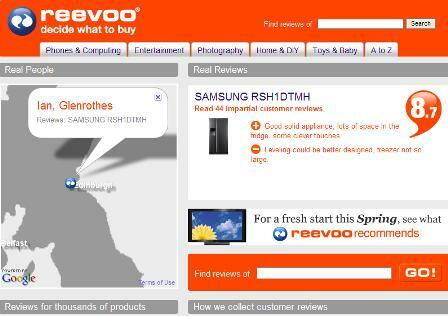 Online consumer reviews aggregator Reevoo has announced a second round of funding led by French VC firm Banexi, as well as launching its service across the Channel. Marks & Spencer revamped its website last year, and enjoyed a successful Christmas online, increasing its web sales by 78% in the 13 weeks to the end of December. 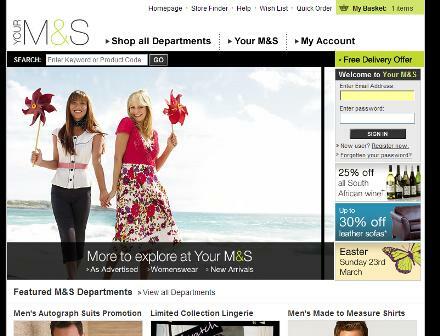 The M&S website scored badly in a usability study last year though, so there may still be room for improvement to the user experience. Amazon is one of the great e-commerce success stories, and we often use the site as an example of best practice. But what can it improve? The site’s usability isn’t perfect but users have become familiar with the way it works, and Amazon won’t want to mess with a winning formula. It’s the same story with eBay. Change isn’t so easy once you achieve scale at a global level.